A table in Chilton’s Freeport showroom drinks in the August sunlight. Call it a rejection of convenience over quality. Call it an inevitable counterswing to the Instagramming and Twitterizing that bring to each aspect of life the obligation of a press release. Call it hipsterism gone airborne. Across the country, handcrafted, single-function items are having their day. Artisanal is in. No longer is it unthinkable to support oneself baking cupcakes, tanning leather, turning canoe paddles from blocks of pine, slinging soba noodles from a jerry-rigged delivery truck. The public—and younger public, in particular—is reeducating itself, both as makers and consumers, in the value of time-and-skill-intensive products. In the process, they’re getting a taste for Maine. A demand, to be sure, that has spread—is spreading—beyond the forestry products of our heritage (i.e., furniture making since forever, and shipbuilding before that). Maine breweries now have national reputations. World-class artists in a variety of mediums are coming to paint, to sculpt, to photograph, to write. Bon Appétit, in August, named Portland the Restaurant City of 2018. The words “Made in Maine” have acquired a newfound cachet, and crackling in the air is a (cautiously optimistic) sense that if you want to make a go of it here, working with your hands, you can. In a state with little centralized industry, makers are becoming the industry. The Messler Gallery at the Center for Furniture Craftsmanship holds four shows a year, open to the public. Seen here is a collection of faculty work. Freedom is the privilege. Maine’s makers are a fiercely independent bunch—pragmatic, problem-solving, protectors and trusters of reputation and word, and devoted, most crucially, to bringing the fullness of their abilities to the completion of each task, whether honing the ratio of bitters in a cocktail recipe or throwing another bowl to get the order shipped inside of contract. For these people, fulfillment springs less from commercial excess and more from a certain autonomy, work done well for work done well’s sake. It’s an ethos that perhaps delivers some account as to the swelling manna afforded the “Made in Maine” label. The qualities that define the craftsperson—and in turn the objects she creates—are qualities echoed by Maine itself. In their sun-warmed Freeport showroom, Jennifer runs a hand up the back of an authentic Shaker chair. “The spacing in the slats is one of the things that’s so special,” she says. Much of Chilton’s inventory is based on original Shaker designs, many from Sabbathday Lake near Poland, the world’s last active Shaker community. “There is a very deliberate, very precise spacing of the slats. Each one is adjusted again and again until they follow right up along the spine.” This insistence on getting it right—not almost right, but right—is Maine to the core. One thing Mainers are not is corner cutters, and while “handcrafted” might feel like a craze elsewhere, in Maine it feels like confirmation. 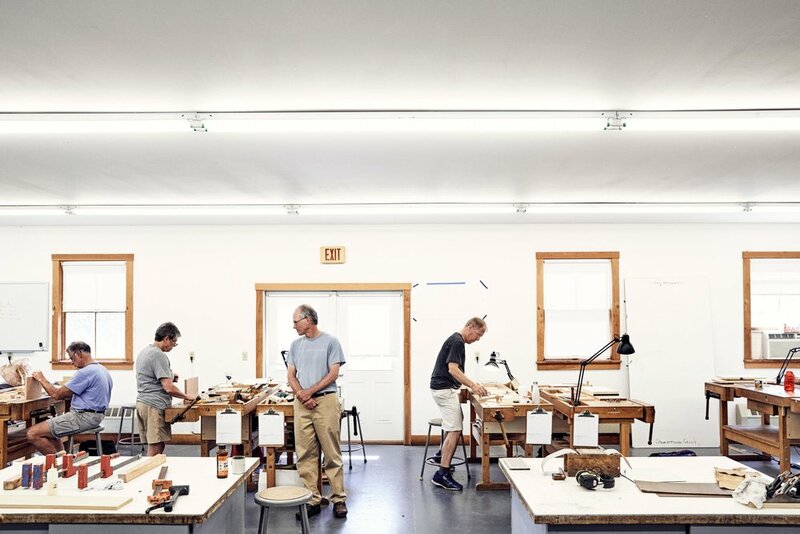 Again and again, the students at the Cen ter for Furniture Craftsmanship speak unprompted of a deep satisfaction that arrives when one has made from nothing an object that truly works, and it seems impossible that this satisfaction is not, in big part, what drives these people to Maine to do their work. It’s a lifestyle as much as a career, and very likely this is the draw. Again, Jennifer Levin invokes the Shakers: “They believed in perfecting life on earth,” she says, “‘Hands to work; hearts to God.’ It’s not just for making lots of money. Maine is for people who want to have a balanced life.” The Levins would know. They traded New York for Scarborough in this very spirit. It isn’t for everyone. But it can be done—is being done, all over the state. For Maine, this cultural tilt towards a more symbiotic relationship between life and work is perhaps a realm in which old meets new more plainly than might be evident elsewhere. In the coming installments of “Made in Maine,” we’ll turn to a variety of makers working today in this space of change, those inventing the state anew while inescapably participating in its past. Are there cheaper ways to do what they’re doing? Certainly. Are there faster ways? God, yes. Are there better ways? It depends on what you consider “better.” Let’s ask them.